The days are wild and the nights are rockin'! As a kid, I grew up through the 1970s revival of the 1950s and got into it with everybody else. I loved Happy Days and I saw Grease something like six times the summer of 1978. 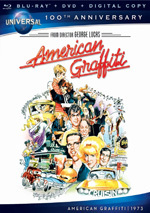 All of this nostalgia occurred largely because of 1973�s American Graffiti, as that movie's surprise success inspired a raft of imitators that continued to pop up years later. Oddly, much of this material didn't actually take place in the Fifties. Graffiti itself was supposed to be in 1962, and 1980's The Hollywood Knights pushes the envelope even further with events that transpire in 1965. Chronological discrepancies aside, both pictures really are Fifties movies in spirit, because �The Sixties� - like most decades � didn�t remain confined by the numbers. Many people think of �The Sixties� as beginning in early 1964 when the Beatles hit America. However, if the storytellers of Knights are to be believed, the social revolution embodied by the British Invasion and the politically relevant singer-songwriters like Dylan hadn't made much of an impact by Halloween, 1965, when this story takes place. As shown here, the world hadn't changed a whole lot since the 1962 of Graffiti. That�s probably because Knights offers a shameless rip-off of American Graffiti. The structure is exactly the same: we have a loosely-connected group of peers whose interactions we watch on one particular night. 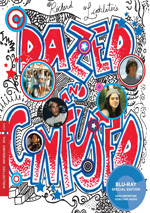 The evening in question happens to come only hours prior to life-altering events; in Graffiti, some characters are about to head to college, while in Knights, a local hangout is closing and one dude's going to Vietnam. We see the various substories intercut with each other. In addition, both movies feature soundtracks that consist only of the era's popular music, and both involve other strong similarities. We find matching quests involving disc jockeys, nerdy characters who prove themelves with women, strong attractions to cheap drive-in restaurants, and God knows how many other commonalities. During director Floyd Mutrux's audio commentary on the original DVD, he never once mentioned how similar the two films are; he discussed Graffiti in passing but mainly to note that Lucas had expressed how tough it is to film a movie completely at night and Mutrux agreed. Maybe over years Mutrux convinced himself that Knights wasn't just an insipid rip-off of Graffiti, but don't believe it for a second; the similarities are simply too numerous to be coincidental. I also find it bizarre that Mutrux posits a "change of an era" in 1965. As I mentioned earlier, that date can work for some reasons, but 1962 really makes a lot more sense. That period came right before the serious upheaval of the civil rights movement, Vietnam, Kennedy's assassination and the aforementioned revolution in popular music, whereas 1965 happened during or after those events. Things were already changing during the film's time period, but Mutrux wants us to believe that we were just on the cusp of this. The movie's complete absence of any British Invasion music makes his unreal picture even odder. When I started to write this review, I was going to go easy on the filmmakers for this because it seems like it might be tough to get the rights to Beatles and Stones songs. However, I then remembered that in 1978, I Wanna Hold Your Hand - a similarly low-budget effort - featured a whole roster of classic Beatles tunes. This says to me it must not have been all that difficult/expensive back then. Even if the Fabs were too pricey, the rights to other British Invasion songs certainly could have been obtained cheaply. As such, I can't help but think their omission came from some bizarre desire on the part of the filmmakers to fit the era to their odd thesis. Granted, in one scene a character does mention a TV appearance by the Stones, but that's it; otherwise this world inexplicably lacks the period's most popular music. Why? I think just because the director and the others want to show a world untainted with that "progressive" element so the stupid movie can look much more like Graffiti. Actually, I can't call Knights simply a straight rip-off of Graffiti, because it clearly steals from 1978�s Animal House as well. Knights is much smuttier than Graffiti and features jokes that strongly presage movies like 1982�s Porky�s and 1998�s There�s Something About Mary. We find a great deal of tasteless and crude sexual and scatological content that appears for no reason than to attempt cheap laughs. The Animal House component seems to enter from a number of sides. Minor swipes appear in forms such as Knights' closing song, a title tune that bears more than a slight resemblance to the ditty that ends Animal House. More significantly, however, is Knights� apparent Belushi-wannabe, Newbomb Turk (Robert Wuhl). Unlike the crude but stupidly witty Bluto in Animal House, Turk is just annoying and unlikable. Turk and his friends are jerks, really, with no redeeming value. At least the boys of Delta House were just looking for a good time for themselves and only struck back when attacked by others; Turk, et al, actively pursue the art of nastiness and puerile cruelty, somehow offered in the sense of wacky hijinks. We�re supposed to like and admire these nutty rebels, but instead, they just seem like selfish, immature, sadistic morons. And at least the makers of Animal House tried to give us some explanation for the advanced age of Bluto, since he'd failed many grades. We're supposed to buy both Wuhl and Tony Danza - both then in their late twenties � as teenagers, and they also give us Stuart Pankin � then in his mid-thirties, for God's sake! - as a high school student! I don't think Wuhl and Pankin ever looked like teenagers, but they clearly were well past that point in 1980. Fran Drescher also seems old for a teenager, but at least she was chronologically close in 1980; she was 22 when the film was made, though she looks a lot older. It seems vaguely amazing that she went from teenage girl here to mature record executive Bobbi Flekman in This Is Spinal Tap in the span of just three years. Although this is technically an ensemble piece, the situation clearly is not equal, as Turk dominates the proceedings; it's virtually wall-to-wall Wuhl. Danza is the nominal star - his role on Taxi made him the biggest "name" in the cast at the time - but it seems like he barely appears. Actually, the same goes for most of the characters. With the exceptions of the annoying Turk and the nerdy Dudley (Pankin), most of the other kids just kind of blend in together; I honestly can't even remember these people's names at this point because the personalities left such a minor mark on me. The acting doesn't help. The performers mainly seem loud and screechy, and none come across as appealing or even intriguing. There are some talented folks here, from Wuhl to Drescher to Michelle Pfeiffer in her very first theatrical film, but none of them have a positive impact, and most of the actors are actively unlikable. Mutrux doesn't help matters with the confused and disjointed storytelling. Events flit all over the place with no rhyme or reason, and any attempt at a coherent narrative seems absent. Granted, the movie lacks a true plot anyway, but the mini-stories should offer some logical nature, and that's not the case; they're just jumbled collections of events that make little sense within any sort of normal time continuum. The film stumbles from wacky gag to wacky gag with little momentum or sensible rhythm. Knights is the worst kind of teen-exploitation film. It thinks it's being "relevant" because it tosses in the subplot in which a character goes to Vietnam, but that aspect of the film is useless and actually somewhat insulting in such a setting. The crudeness of this piece seems staggering even 30-plus years later; the flick is littered with crass, loud and unfunny attempts at humor that are nothing other than stupid and tasteless. The Hollywood Knights ends up as one of the most inane and nasty films I've seen. I didn't just dislike this tasteless and crude plagiarism of American Graffiti and Animal House - I hated it. It actually makes junk like Porky's look witty and intelligent by comparison, and those are words I never thought I'd write. I've watched movies I liked less than Knights, but that's an extremely short list. The Hollywood Knights appears in an aspect ratio of approximately 1.85:1 on this Blu-Ray Disc. This wasn�t a great presentation but it looked better than one might expect. A low-budget effort, the image showed some remnants of its cheapness, mainly due to the lackluster film stock. Sharpness occasionally took a hit, with a bit of softness in the occasional scene; mainly, interiors tended to look a bit iffy. Those instances weren�t significant, though, as most of the movie exhibited positive clarity. I noticed no issues with jagged edges or shimmering, and edge haloes were minor. To my surprise, source flaws created no concerns at all, as the movie remained free from defects. We got a natural level of grain but no specks, marks or other issues. Colors tended to seem pretty solid. The palette had a bit of a heavy feel to it, but I thought that was intentional, and the hues usually appeared rich and lively. Blacks were dark and tight, while shadows showed fairly positive clarity. Nothing here really excelled, but given the movie�s age and origins, the visuals worked quite well. As for the DTS-HD MA 5.1 soundtrack of Knights, it remixed the monaural source material in a minor manner. For the most part, the audio stayed heavily anchored in the front center. Music showed a gentle spread to the sides, and some effects also broadened to the other channels. We even got the occasional movement effect, such as one scene in which a car drove from the front to the right rear channel. None of these did anything to add much pizzazz to the package, though, as it remained a glorified mono track; don�t expect much more than that. Audio quality appeared fine for its age. Speech lacked much life but the lines were reasonably natural and always intelligible. Music tended to be flat, however, as the various tunes didn�t display great vivacity; they weren�t shrill or distorted, but they lacked punch. Effects were a minor factor but seemed decent; those elements came across as thin but acceptable. All of this added up to an average mix. How did the Blu-ray compare to the original DVD from 2000? Both showed improvements. While it�s a disappointment the Blu-ray lacks the movie�s original monaural soundtrack, at least the 5.1 track offers substantially superior fidelity when compared to the screechy audio from the DVD. Visuals also looked tighter and cleaner. This created a nice upgrade. Unfortunately, other than a trailer, the Blu-ray comes with no extras. The old DVD wasn�t packed, but it came with a commentary that fails to reappear here. I expected little from The Hollywood Knights but even then it came as a horrible disappointment. Put simply, this is one of the most unfunny and charmless "comedies" I've seen in a long time. The Blu-ray provides pretty good picture and decent audio but lacks supplements. Fans will appreciate the presentation of the film, but unless you know you love this monstrosity, stay far away from it.